Connected interfaces removed—this is often handled as a route removal, but it impacts more than just multihop routes; removing a connected route implies loss of reachability to a specific set of neighbors, and hence that set of neighbors need to be moved into a down state, along with recalculation of routing information, etc. Given this information, what does it look like? 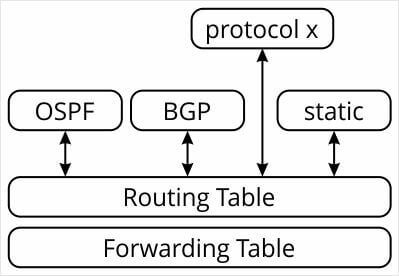 Generally speaking, the information traded between routing processes and the RIB flow through a set of Interprocess Communication (IPC) calls within the system itself, and are defined by the code base. For instance, Cisco, Juniper, and OpenSwitch all have fairly unique interfaces between the protocols and the RIB. Cumulus uses Debian UNIX calls for its interface. Once the route is installed, all the dependent routes must be checked for validity, if they need updates, etc. Counting the calls up, it’s easy to see that each installed route can cause six or more passes through the protocol/RIB API, and a couple more in other places. This means that for each route installed in the RIB, the RIB itself must take eight to ten separate actions. In practical terms, this means the RIB must be able to process transactions at a rate around eight to ten times faster than you expect the device to converge. For instance, if the device needs to converge on 250,000 routes in one minute, then the RIB needs to be able to handle on the order of 2 million transactions in that same minute. 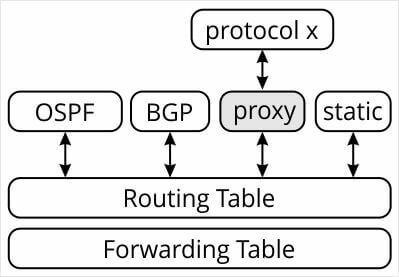 If I wanted to go one step further, I could make the interface between protocol x and the proxy a standard, open, interface. This is precisely what the I2RS specifications do—the proxy is called an agent, and protocol x is called a client. The interface between these two is described using YANG models, which are more commonly used for device configuration. One immediate question that should spring to mind at this point is—can this remote interface, passing through a standardized model, ever operate as quickly and/or efficiently as a native interface into the device RIB? The clear answer, based on lots of experience and just plain common engineering sense, is no. Then what’s the point of all this work? The answer to that question will need to wait ’til next time. Non-time dependent routing policy? 🙂 Blackholing, LFIB manipulation/tunneling, etc. off-box via a standard API? I’ve only just been loosely following the IETF I2RS WG headlines/chatter, so thanks for the high level overview for the lazy. Steve – i don’t think you’d want to manipulate forwarding over I2RS, it is meant to manipulate control plane, and adheres to basic control plane attributes such as protocol preference/protocol origin/etc. It is up to RIB to select the best route (not necessarily the one provided over I2RS). Data models are rather important there as you could compare intended state (the state after the change has taken place) to the current state and act accordingly. Jeff — I think it depends on what you consider “manipulating forwarding” — IMHO, the specific use case for I2RS is to manipulate forwarding by injecting RIB entries that override what other routing protocols/manually configured routing information have injected into the RIB. I’m not certain what else you’d use a direct RIB API for than injecting routes? I think we’re probably just using different terminology here. RIB is not the only producer of forwarding information on the system.